Coconut Palm trees abound and you find them on the street, in the canals and on the beaches. You can climb a tree and pick one, but I prefer to wait until they drop by themselves when they are fully ripe. It's is quite a bit of work getting the husk off so your going to really want to have some fresh Coconut in order to be motivated. Once the husk is removed its a simple matter to drive a phillips screw driver or awl thru one of the three eyes located at one end of the shell and drain the coconut water, which is good to drink. Strike the hard shell on a hard object or tap it with a hammer to break it open and easily pry the coconut meat from the shell with a butter knife. Coconuts are distinct from other fruits because the contains a large quantity of clear liquid, called "coconut milk" in the literature, and when immature, may be harvested for their potable "coconut water", also called "coconut juice". Some people confuse the coconut water you drain from the shell with "cream of coconut" used an a ingredient to the Pina Colada drink, which is made by processing the coconut meat inside the shell. As the fruit ages, the water solidifies into the white meat and is pressed for milk or oil. You can't walk anywhere in Cape Coral without finding them. 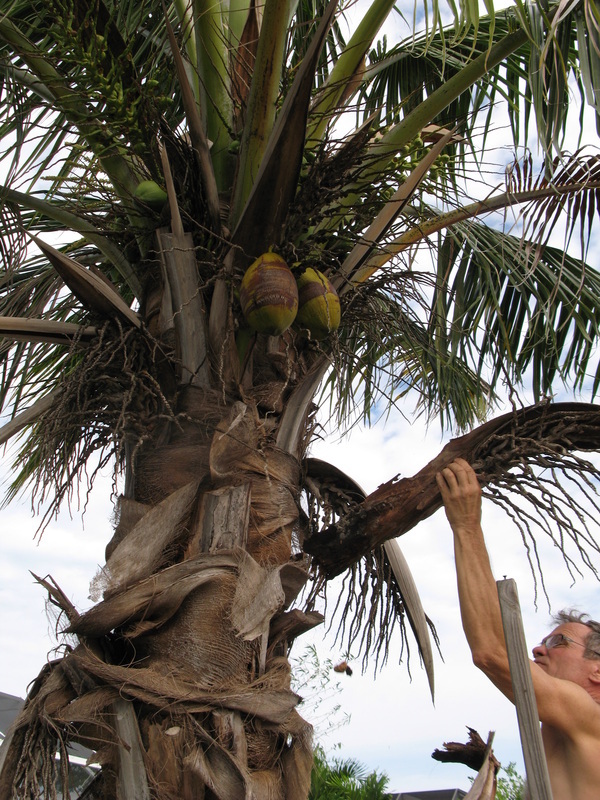 My neighbor Paul across the street has coconut palm trees, which he planted as seeds. He will be happy to provide you all you want, although you may have to shuck them which is difficult. 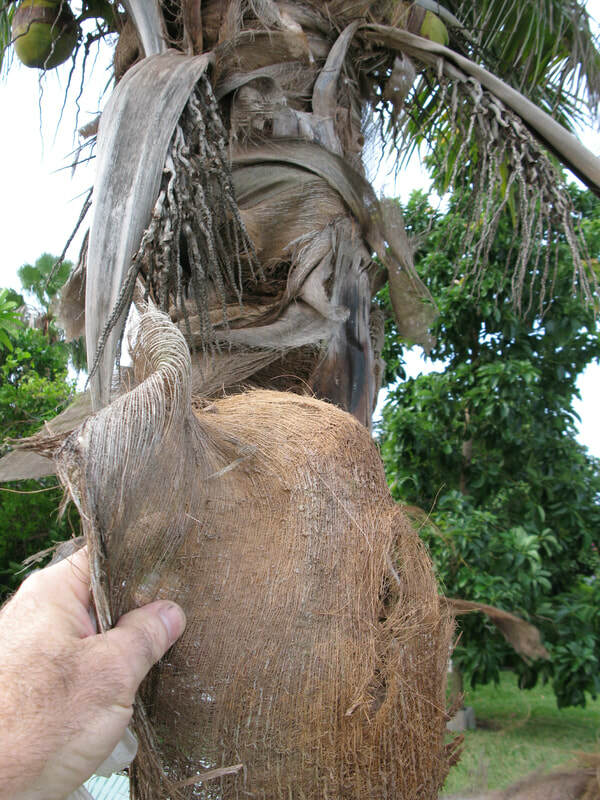 I frequently see coconuts that have dropped sitting on another neighbors lawn or on the beach and a tree has emerged from the coconut and started to grow. 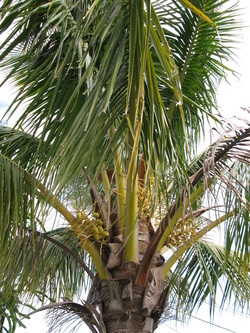 The Coconut after all are seeds which the tree produces to reproduce. Mature, ripe coconuts can be husked and used as edible seeds, or processed for oil and plant milk from the flesh, charcoal from the hard shell, and coir from the fibrous husk. Dried coconut flesh is called copra, and the oil and milk derived from it are commonly used in cooking – frying in particular – as well as in soaps and cosmetics.